What are energy drinks and what are their advantages and disadvantages? Energy drinks – It is a type of drink which provides mental and physical stimulation which may last for few hours depending upon the caffeine content. They are sometimes carbonated. Many drinks contain sugar or other sweetness also. The caffeinated beverages such as coffee, tea, and soft drinks may contain caffeine, but they are not considered energy drinks. Some alcoholic beverages containing caffeine and other stimulants are actually energy drinks. The caffeinated alcoholic beverages that contain high doses of caffeine are Taurine-amino acids, Guarana, Gimseng etc. 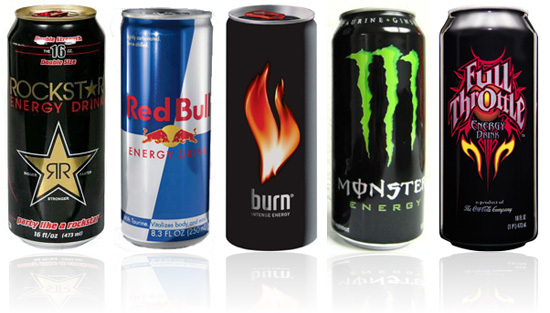 The most popular energy drinks in the world are Red Bull, Monster, Rockstar, NOS, Amp, Full Throttle, Lucozade, Cobra etc. Advantages of energy drinks – Energy drinks produce feeling of alertness and wakefulness. It increases fitness levels and endurance as most of the energy drinks contain 18 to 25 grams of carbohydrates per 8 ounces. For students, it produces wakefulness which is beneficial for studies. It also increases nervous activities; elevate heart rate and blood pressure. Disadvantages of energy drinks – There are more disadvantages of taking energy drinks than advantages. It makes kids and young addictive of these drinks. The high caffeine content may cause insomnia, nervousness, rapid heartbeat and headache. Many energy drinks contain high sugar content which may cause obesity. It may also sometimes cause sleeplessness if consumed regularly. So it is beneficial if taken with care but harmful and dangerous if become addicted. Great information! Thank you for following BrewNSpew.